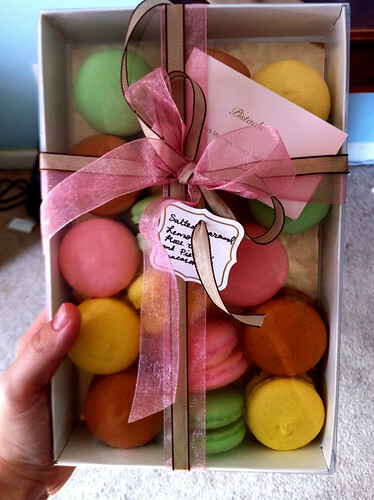 Macarons are apparently the new cupcake. Unlike the cupcake, though, they’re not terribly easy to DIY. I tried once, after I bought a slim cookbook full of gorgeous photos of the ganache-filled French cookies. It was a disaster – making my own almond flour was ridiculously hard, and my cookies came out flat and burned. Discouraged, I didn’t even bother to whip up any filling. I haven’t tried again. I just accepted that I can’t make macarons. 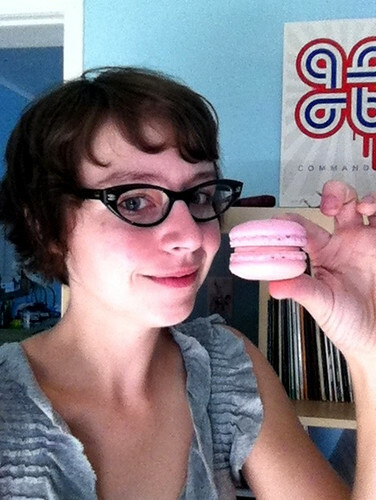 But Erica from Memphis-based Pistache Pastry can, and she’s willing to bring them to your house. I ordered a box of the adorably colorful cookies through Pistache Pastry’s Etsy shop on Friday, and they were delivered to my house yesterday afternoon. Each box of 16 ($24) comes with four flavors – I chose sea salted caramel, pistachio, lemon curd and rosewater. Unlike my failed macarons, these were perfectly fluffy. They’re sort of like a super Oreo, with the rich, creamy filling sandwiched between two sweet, spongy cookies. The sea salt caramel was more caramel than salty (but still delicious), and the lemon curd was tart and refreshing (especially after keeping the cookies in the ‘fridge). My favorite was the rosewater – the cookies aren’t flavored, but the filling was light, creamy and very delicately flavored. If you want to get your own, you can order them by the box from Pistache Pastry. If you live in Memphis, Erica will bring them to your house. If not, she’ll ship them to you. She also does custom orders, allowing you to mix cookie colors and fillings and add monograms or stencils. My husband and I were just talking about macarons the other day. We had the famous ones when we were in Paris and were reminiscing how good they were and wondering where we could find them in the states. Now we know! Thank you! I baked about 9 batches before I was happy with my macarons. I’m glad to know we have someone in Memphis offering these!